Surf fishing for speckled trout is one of the best fishing experiences I’ve ever had. It’s simple to do and the action is fast and furious. In this review, we’ll look at the best ways to catch speckled trout in the surf and the methods that work year in and year out. From Texas to Florida, surf fishing for speckled trout is an annual event each summer that draws anglers from all around. Speckled trout migrate from the open waters of the Gulf of Mexico into the surf before ultimately ending up in the bays and estuaries to spawn. Late April to early May and into the summer months is the best time to catch trout in the surf. In this guide, I’ll discuss the best ways to catch trout in the surf and the tips I’ve learned along the way that help make fishing for trout successful. Below are the top 3 best ways to catch trout in the surf. These tactics I’ve come to realize are the most important factors when it comes to consistently catching trout in the surf. Fishing for trout in the surf is almost entirely dependent on the wind and weather. The ideal conditions for fishing the surf are when the wind is calm, the water is flat, clarity is good, and the water temps are in the mid 80’s. Always key in on calm days to have the best luck fishing in the surf. I constantly monitor the weather sites when it appears that a good window may be approaching. Most beaches have web cameras that stream live feeds which can be invaluable for gauging wave height and water clarity. Use these features to your advantage. Calm days in the surf usually lead to better water clarity since waves aren’t stirring up sediment and increasing turbidity. Waves also make fishing the surf more difficult as you constantly have to dodge them and this gets tiring after a long day of fishing. The best time to fish the surf for speckled trout is when the water is green and the clarity is good. When the surf is “green to the beach” is when you should be fishing. Water clarity is important because trout are visual feeders and need to see what they are ambushing. If it’s difficult for them to see your lure, fishing will be tough. Water clarity is almost always tied to wind and tide conditions. Strong winds cause large waves that stir up sediment and debris that reduce visibility. That’s why fishing on calm days often result in better water conditions. 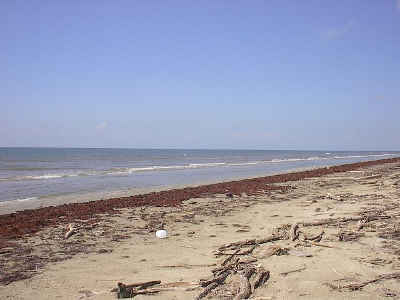 There are thousands of miles of beach on the Gulf Coast and trying to find a spot to fish for trout can be difficult. Rather than randomly stopping to start fishing, here are a few tips on what you should look for that may indicate trout are nearby. Seagulls and other shorebirds are the best giveaway that fish are feeding in the surf. When trout feed, they push bait fish to the surface of the water. Bird’s key in on the bait fish and will hover and dive into the water for an easy meal. Birds are a great tool to use to gauge what’s happening under the water. Shell banks are bits of shell and shell hash that exist in certain areas along a beach. These deposits of shell can provide a unique habitat for prey that trout feed on as well as a unique habitat other than sand. Key in on habitat changes like shell banks that could hold lots of trout in the surf. Structure is very important and trout often congregate behind it in the surf. Not only does it provide protection from waves and current, but bait fish and prey species use the debris as cover. Pilings, piers, jetties, and driftwood are all examples of structure that can make trout fishing in the surf even better. If you’ve ever driven down the beach for a couple miles, you know that everything starts looking the same. While this does make it difficult to pick a place to fish, it’s also helpful in that something different really does seem out of place. When looking for the best places to catch trout in the surf, look for subtle clues like a change in wave direction that might signal a current change in a particular spot or ripples that may indicate nervous water below. These clues will help you narrow your focus and fish the areas trout are more likely to be. One of the most common mistakes made while fishing for trout in the surf is to walk out to waist deep water and then start fishing. Not only are you missing a viable opportunity to catch more fish, but bigger fish as well. The best method for fishing the surf for trout is to start at the water’s edge and work your way out. It’s common for large trout to feed in as little as 6 inches of water during the night and they often are there at sunrise as well. Starting off by casting into the first cut on the beach can help you land some really large trout that you may have walked past otherwise. Where there are bait fish, predators are often close by. The top food item for a speckled trout in the surf is small bait fish like Mullet. Mullet often swim in large groups down the beach and are easy to spot on calm days. Always key in on large pods of bait fish to find schools of feeding trout. Another tip is to look for jumping bait in the surf to indicate that trout are actively feeding. This includes mullet, shrimp, and other bait fish leaving the water momentarily to escape predators below. If the surf lacks the presence of bait fish, then it usually indicates that the feeding window for predators has already occurred or is happening elsewhere. Some of the best times to take advantage of trout feeding in the surf is at sunrise and sunset. Having everything in your favor means very little if you don’t have the right equipment to catch speckled trout. Below is the equipment and lures I recommend that will help you catch more trout in the surf. Castaway 7ft Graphite Rod (click to see it at Cabelas) – Castway has been making lightweight durable graphite rods for over 20 years. I’ve used their 7ft saltwater model for over 10 years now with no issues. It’s the perfect surf fishing rod and will last a long time. Shimano Curado Bait Cast Reel (click to see it at Cabelas) – Ask anyone what the best bait casting reel is for the surf and they will undoubtedly say the Shimano Curado. It casts further than any spinning reel and it’s easy to disassemble for cleaning (something that is a necessity after submerging a reel in saltwater). Norton Sand Eel Jr. (click to see it at Amazon) – The best soft plastic lure to catch trout in the surf is the Norton Sand Eel Jr. This sleek looking soft plastic glides through the water with ease and the trout can’t resist it. Red with a white tail is my go to color and I pair it with a ¼ ounce jig head like this one. Rat-L-Trap Lure (click to see it at Amazon) – I always think of bass fishing when I think of Rat-L-Trap lures, but they work extremely well in the surf as well. Trout love the back and forth movement and the sound that Rat-L-Traps make. Heddon Saltwater Super Spook (click to see it at Amazon) – Using top water lures to catch trout in the surf is some of the most exciting fishing you can find anywhere. The Super Spook is a tried and true top water lure that surf trout just can’t resist. Norton Sand Eel Jr – Trout can’t resist the red/white color scheme in the surf. Why should you fish for speckled trout in the surf? Surf fishing is exciting because you never know what you’re going to catch. Even if you’re after trout, you could catch redfish, flounder, sharks, king fish and just about any other fish in the ocean. Another reason to fish for trout in the surf is that it’s really easy to do. You don’t need a boat and most instances you may not even need a 4-wheel drive truck. Having access to the beach is all you need to fish for trout in the surf. Speckled trout are some of the best tasting game fish you can fish eat. They aren’t overly gamey and can be prepared in many ways. Breaded and deep fried is my personal favorite, but speckled trout also work great on the grill. Trout fishing in the surf is a fun family sport that just about anyone can enjoy. Trout usually make their way from the open ocean to the surf in April to May before they spawn in the bays. When the water temperature hits the mid-80’s, the trout fishing really turns on. The best days to fish the surf for trout are days with no wind and good water clarity. Green to the beach conditions mean trout are probably biting in the surf. In order to have the best chance at catching trout in the surf, look for bait fish on top of the water, birds diving or working over schools of fish, or bait jumping. Structure in the surf like piers and pilings help attract trout as well. With the right equipment, conditions, and knowing what to look for as you drive down the beach makes all the difference in the world in determining how successful you’ll be surf fishing for trout. Use these tips on your next surf fishing trip and your stringer will be full in no time.